A door closer adjustment is an art that requires knowledge, patience, and an ability to climb up and down a ladder a few times. But with those attributes and the appropriate wrench, hex key, or screwdriver, you can do the job yourself. Or save yourself some time and let us do the work for you! We’ll go over what a door closer really is, why you might need an adjustment, and for the go-getters how to adjust them yourself! 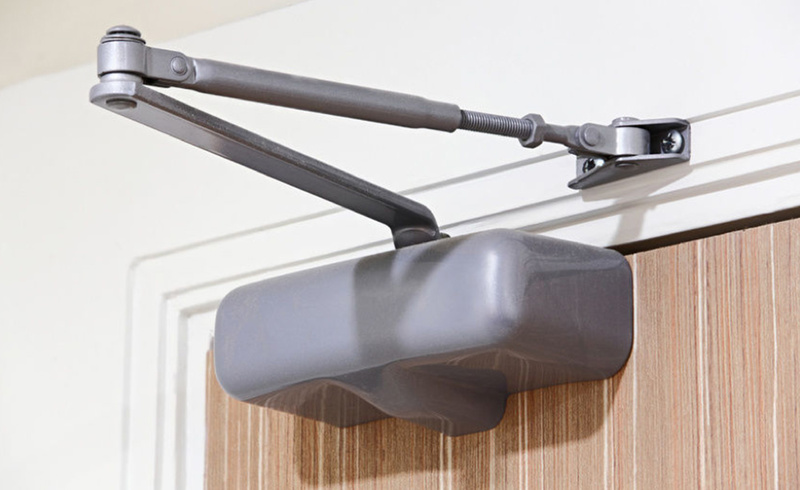 A door closer is a mechanical device designed to close a door slowly but firmly enough to latch. It accomplishes this by using spring tension modulated by hydraulic fluid. As people open the door, hydraulic fluid passes from one reservoir to another. 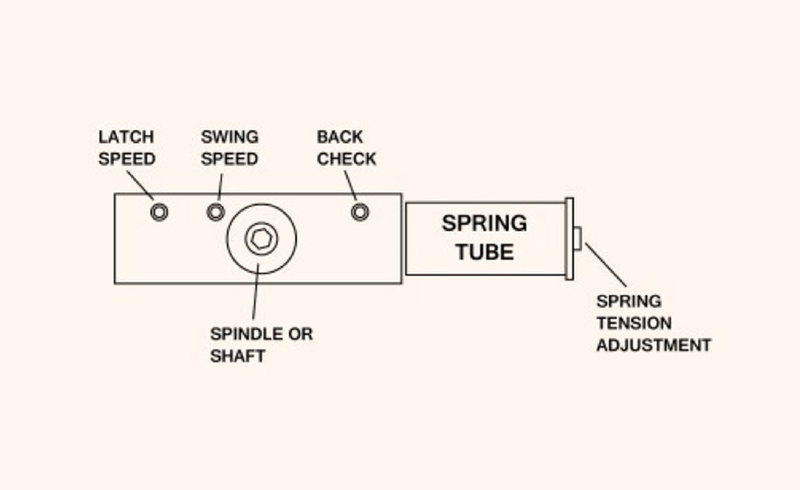 As the spring pushes the door closed again, the hydraulic fluid passes back to the previous reservoir through a series of valves that control the speed. Pretty technical stuff, but what it really comes down to is the control of the speed at which your doors open and close. If you notice doors that used to close slowly, are now slamming shut, then give us a call. Some people often think this action means your entire door is doomed, but we can make adjustments to the swing speed to solve this problem. One telltale sign is if you see oil leaking from your closer. In that case- give us a call to come install a whole new closer. When you’ve got oil coming down your door that usually implies the gears are broken and no amount of adjustments can fix that! 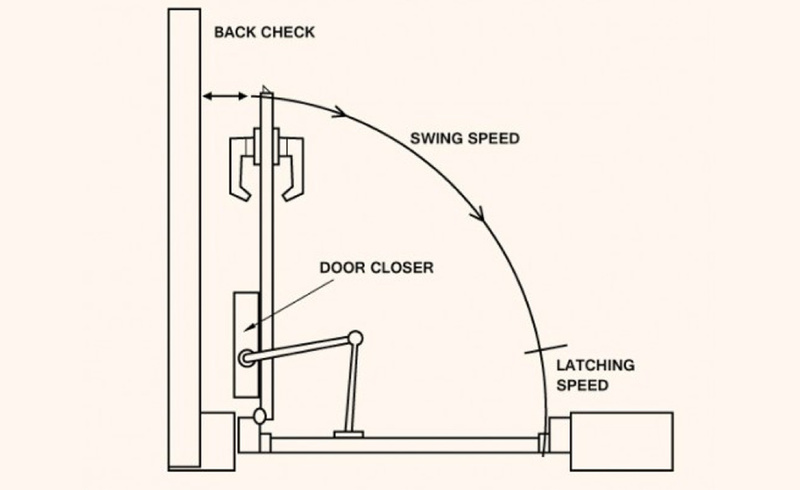 The swing speed and latching speed control how fast the door closes. Many closers also feature a hydraulic control for back check. This controls the last few inches of the opening the door to prevent the door from being slammed into an adjacent wall. Most of the adjustments are implemented by opening and closing hydraulic valves. When it comes to turning the screws that operate these valves, a little goes a long way. A turn of five degrees can significantly increase or decrease closing speed. Swing speed adjustment controls how fast the door closes from fully open to within about five degrees of closed. Latching speed adjustment controls how fast the door closes for those last few inches. Back check adjustment controls the amount of resistance to opening the door past a selected point. Now that you know your door closers need adjusting, let’s talk about how to do that. Pull off the cover. They’re usually held on by tension, but if you can’t easily pop it off, look for fasteners holding it down. Now that you have the cover off, you should be able to see the adjustment screws. If you are lucky, they will be marked on the closer body as to what they are or there will be a diagram inside the cover. If not, you may have to experiment a little to see which is which. Remember, when it comes to turning door closer adjustment screws, a little goes a long way. Start with no more than 1/8 of a turn. Turn the adjustment screw clockwise to slow the door closer down, counter-clockwise to speed it up, then get down off the ladder and observe the effect. Open the door and watch it close. If it closes right the first time, check it 10 more times. When it closes the way you want 10 times in a row, it will probably continue to do so. Ideally a non-delayed action door closer will close and latch the door in seven to eight seconds. This is a simple fix, but it can be time consuming if you’ve never worked with door closers before. 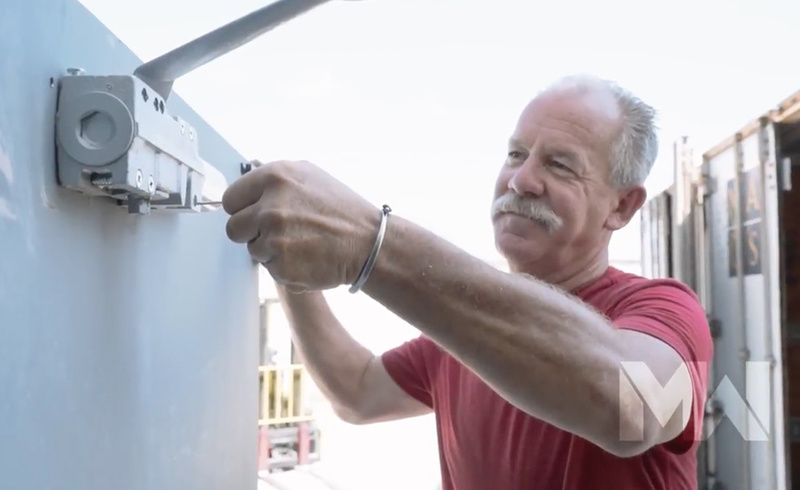 Our installation and repair team can come in and adjust all your doors in less than an hour. We’ve got it down to science and can get a door fixed in the same time it takes to get your coffee! Have a few closers that need adjusted? Give us a call, (402) 464-6348 or submit a request here!